Blue & White relies on two indispensable power sources for our well-being. The most critical player is the maker: the craftsman, the seamstress, the dyer, the weaver. 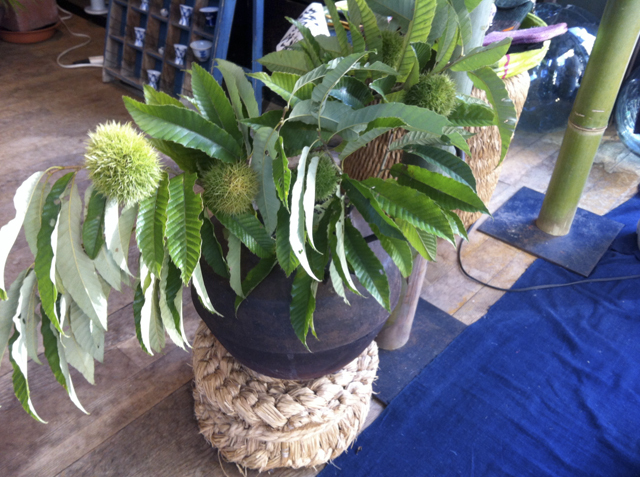 Together they fill the shop with their handwork and give it honesty and purity and beauty. They are the heart and the pulse of Blue & White and their skills and flourishes bring joy and brightness to all who see them. They bring imagination and flights of fancy, humor and playfulness to the shop. They don’t necessarily do things or make things in the usual way that sometimes becomes mechanical and dry as they go along, making the same thing year after year. With their basic skills as a starting point, they experiment with new (and sometimes old) materials and making new things in new ways. Experimenting and breaking rules is part of the flavor they bring to Blue & White. 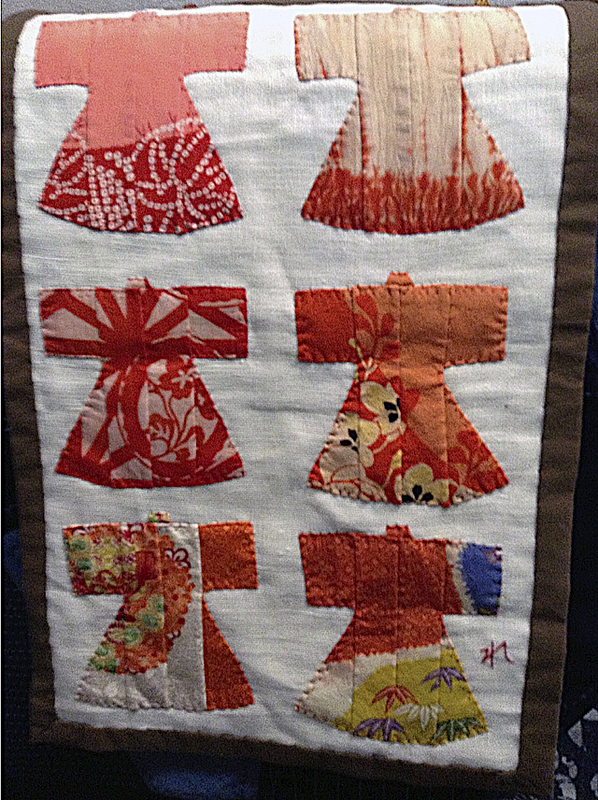 Reiko Inaba did just that with her appliquéd wall hangings of recycled vintage indigo and other snippets that she reworked into Kimono forms.for her appliquéd wall hangings. Inaba san treasured each bit of cloth down to the end, and was able to breathe new life into especially the most threadbare cloth. I found her at Togo Shrine flea market, now discontinued, in Harajuku maybe 15 or 16 years ago. 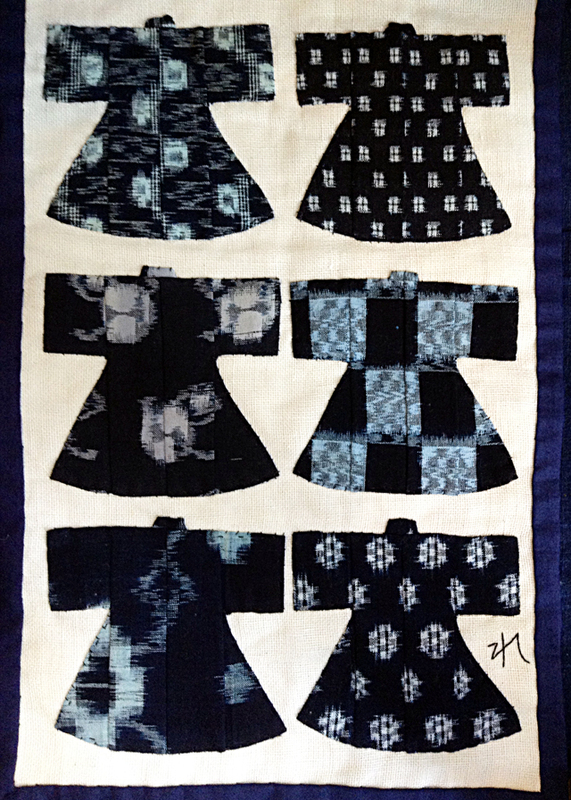 Her bright indigo appliqués commanded a spotlight of their own for their clarity and sense of color and form. 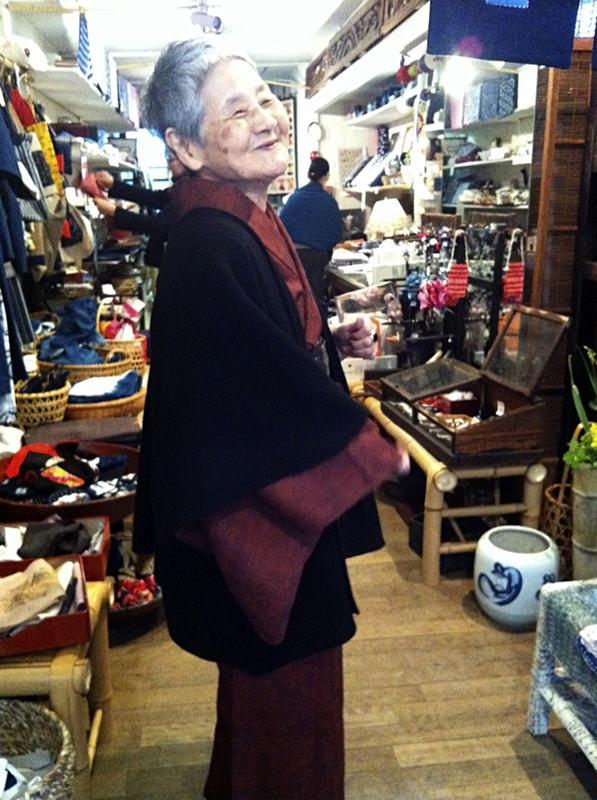 Above all the kimono and other bright things hanging on display, her work had a quiet command of the market scene. Enchanted, I invited her to exhibit her work in Blue & White. She had other suitors as well, but fortunately our shared love of textiles, even the most lowly and forgotten was in sync, and she came to be a generous and passionate and talented member of the Blue & White family. 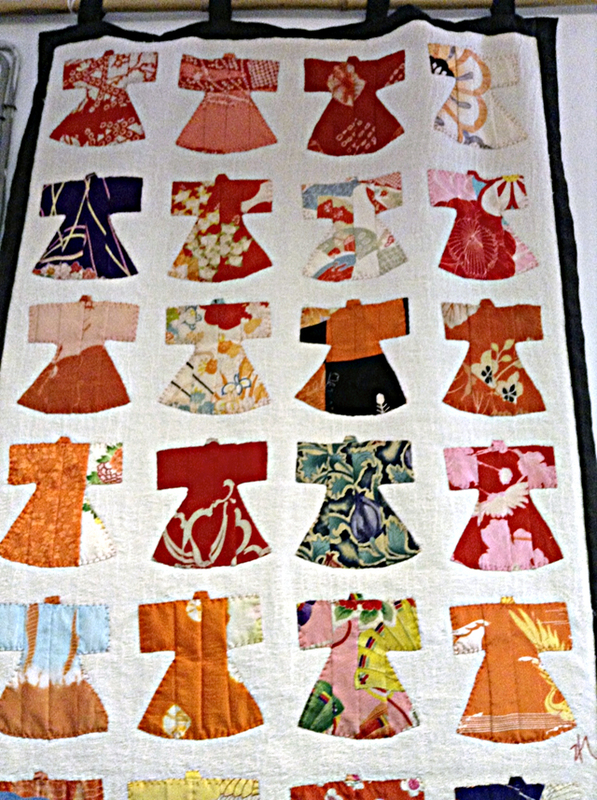 Every time Inaba san came into Blue & White with a new batch of appliquéd Kimono wall hangings, of kimono or monpei, women’s farm pants, or fish – choosing just the right bit of fabric to convey the kimono shapes, the pantaloons with pockets, the fishiness – we held our breath and oohed over her sleight of hand, her perfect choices, her steadfast stitches, all the time marveling that this was the way she had chosen to combat the painful cancer therapy she was undergoing. She turned cancer treatment into a creative force, and there was a depth to her work that no doubt came from her pain. Sewing, vegetable gardening, smoking fish – all were passions she took up to take her mind from her illness. Her visits were moments of happy unveiling, admiring and laughing at her modesty and endless energy. We will miss them mightily. 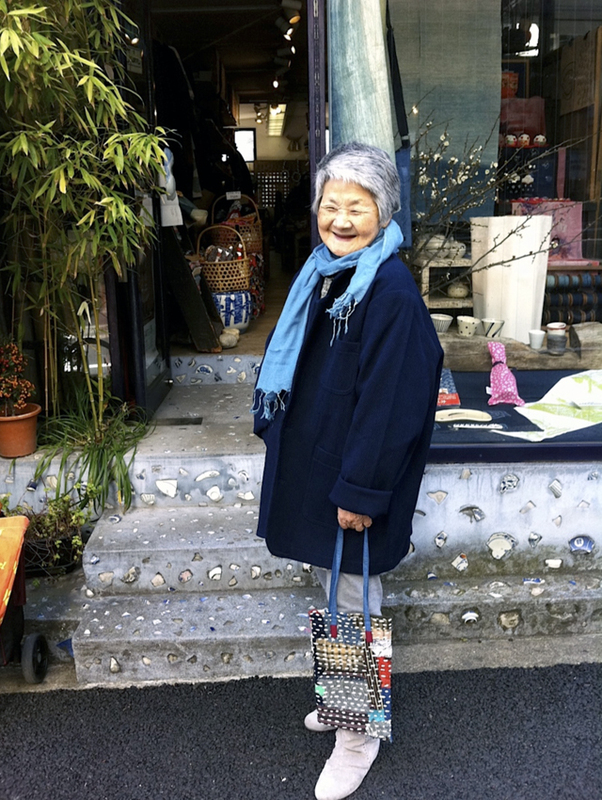 She lost her battle to cancer, but not before she made hundreds upon hundreds of small tapestry jewels that are now hanging in houses in Japan as well as kitchens and stairways and bathrooms and living rooms around the world. Her work was penultimately Japanese, but at the same time universal. 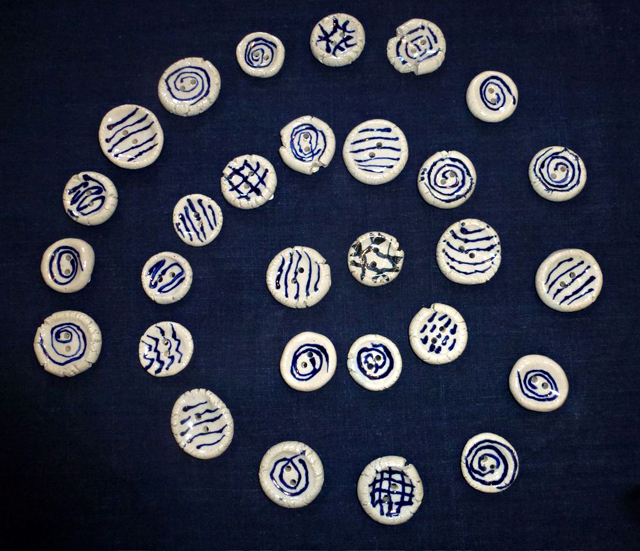 Also essential to team Blue & White are people who come in looking for new things, new forms of craft, new ways to brighten life and often make it easier. Their delight in what they find at Blue & White is a trigger for us get going and keep coming up with new surprises, new creations to delight them and keep them coming back for more. Some people come in weekly to check out what is new, or even to see if they haven’t missed something. They bring chestnuts from their gardens, persimmons from their trees. Some come less often but are still intent on discovering the new thing made by hand that will be a catalyst in their daily life or a perfect present for a friend or a mother (in law). They are all inspectors of sorts who peruse the shelves and examine what is there. Their reactions and comments are invaluable to us and we take their remarks and suggestions very seriously. And some come every day like our dear Rei Kamikubo. Kamikubo san first came in 4 or 5 years ago, a shroud draped in a black cape, with a scarf wrapped round her head, an ominous white mask and a large hat. We could barely see her eyes. There was something frightened about her as she walked tentatively into the shop the first time. Her voice was small and hesitant. As she started to come in more regularly we learned she was enduring treatment for lymphatic cancer and had to keep protected from infection. But she drank in the words of encouragement and support she found at Blue & White and each time she came. Gradually she took off the layers of protection she had worn at first. She came for tea, she came for hugs, she came to laugh and became a daily source of joking and enjoyment. 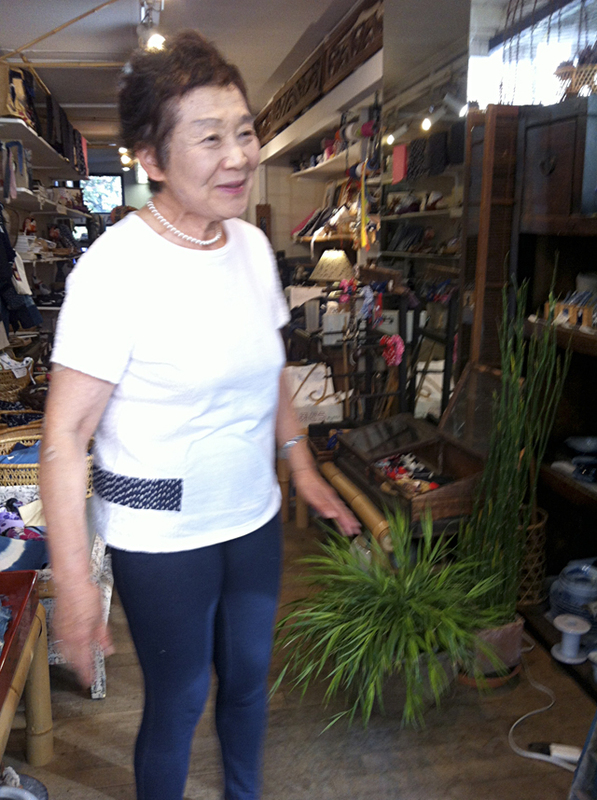 Hovering around 80, she was frisky and playful and loved clothes. She became our private model and we wound up producing a photo book of her modeling all the things she chose from the shop. 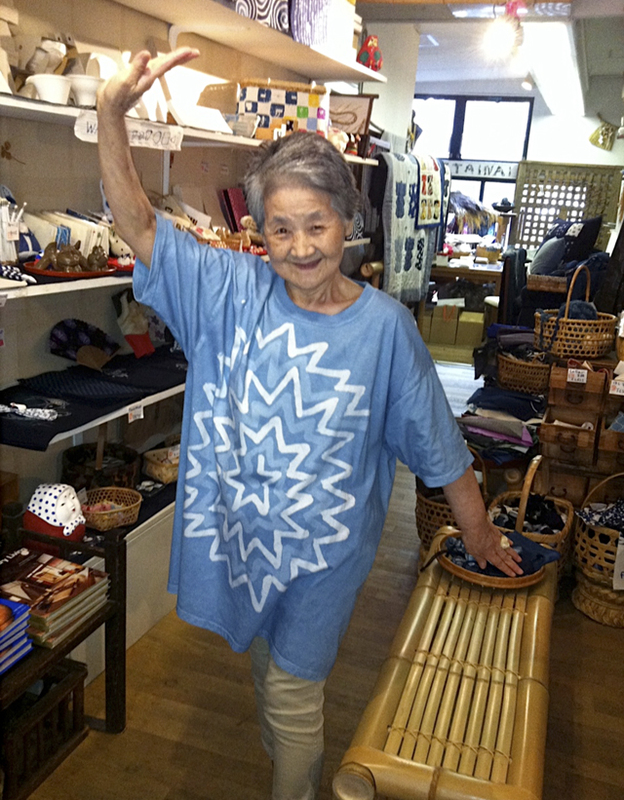 She was a dancer and sometimes proudly came to Blue & White to show us her wonderful sense of style when wearing kimono. She was a clothes horse and looked at home in whatever she chose to wear. 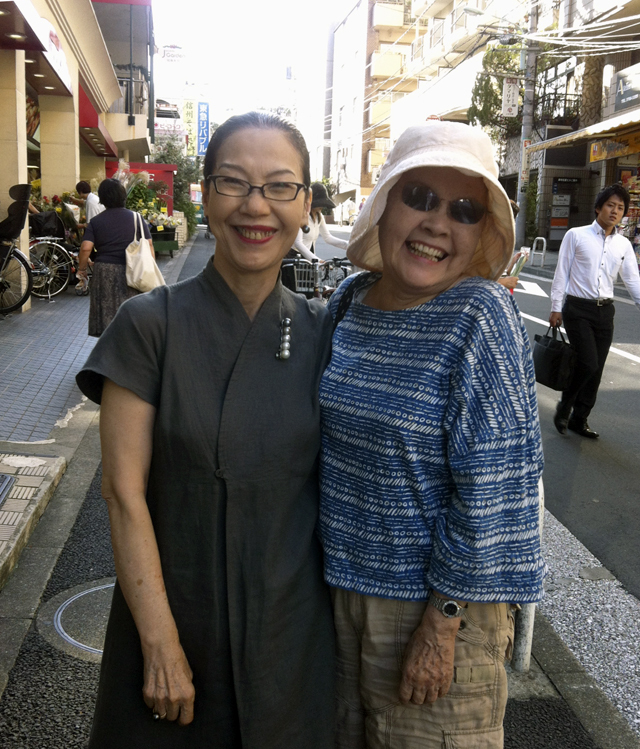 A day was not complete without a visit and a natter with our beloved Kamikubo san who was also number one customer at Peacock Supermarket next door and would bring in treats for tea after she had done her grocery shopping. She comes no more, having lost her feisty battle to cancer, but her laughter and her stories still ring in the shop. 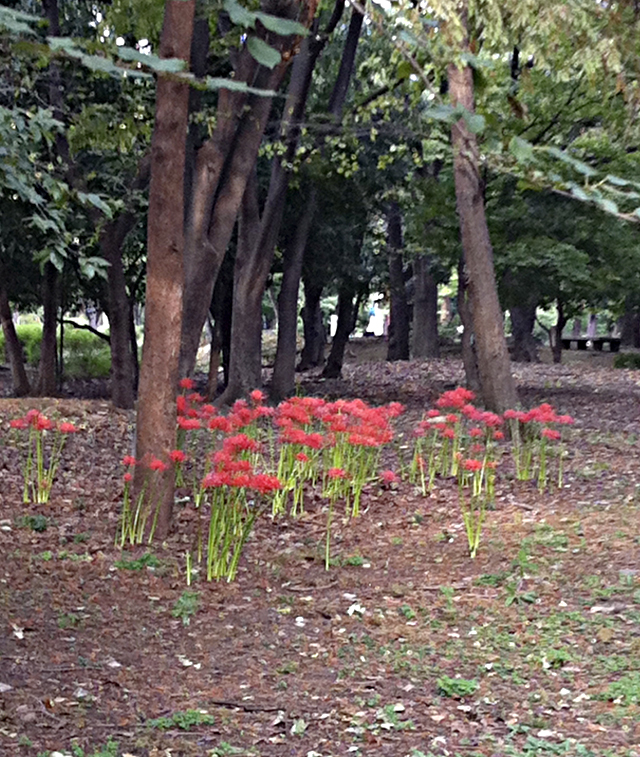 At the time of OHigan, the autumn equinox when Buddhist ceremonies are held to remember the dead, Higan bana (flowers) bloom everywhere as a reminder. Spikey flames of enlightenment, they bloom in the park now, around the rice fields, and along the river. They remind us of members of Team Blue & White who reached enlightenment before us and encourage us to follow their inspiration. Their spirits keep us company in Blue & White. Thank you for the continuing series of wonderful photos of the shop and the beautiful things therein and now, your wonderful customers and friends. It is wonderful! Missing Blue and White and my neighborhood of two years, “the Juban.” This is a wonderful tribute to Inaba-san and her beautiful work. Each time I visited Blue and White, I learned something and felt inspired. Now when I visit your blog I feel the same way. Thanks, Amy:).